We have travelled several thousand miles and the air temperature has plummeted by at least 40 degrees since we left Dakar on the 21st December. 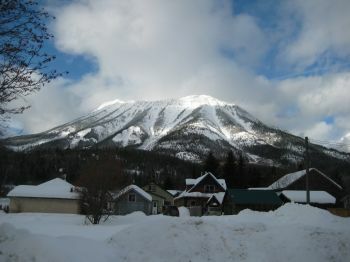 The last leg of our journey involved a Greyhound bus from Calgary to Fernie. On arrival at 3am we discovered that Cathal’s bag of things-that-should-not-be-lost had indeed been lost (later transpired it was stolen) so all in all it was an interesting journey! We spent the first few days here adjusting to the arctic temperatures and finding our feet as part of the NonStop experience. And so far it really has been non-stop! 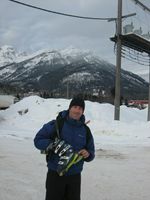 We bought skis and skiboots here in Fernie – an exercise that you may regard as simple but in fact took us 2 days to complete. Last out on the hill….the only Irish people….you get the picture! 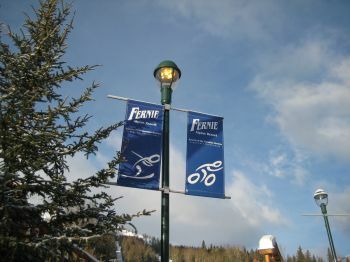 Mount Fernie – behind our lodge The Ski Hill signs! 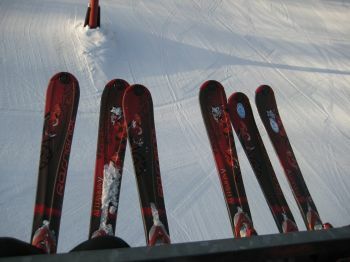 New Matching Skis for the girls! We are staying in a newly renovated lodge, which is full of people on Non Stop Courses. Despite a few teething problems it is a lovely place to stay, and we eat our meals here during the week too. We are sharing the experience with 24 others, whom we are getting to know gradually. A New Years Eve party and a trip to an Ice Hockey game last Friday helped to warm everybody up! We were straight into lessons (which happen four days per week) once we sorted out our gear. 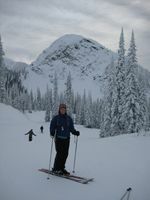 This was followed up by a weekend Avalanche course. The first day was a powerpoint day, but the following day we got to go and dig snow pits, bury things and people and use exciting things like tranceivers and probes. 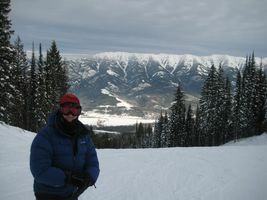 This is all in preparation for our backcountry skiing experience – bring it on!